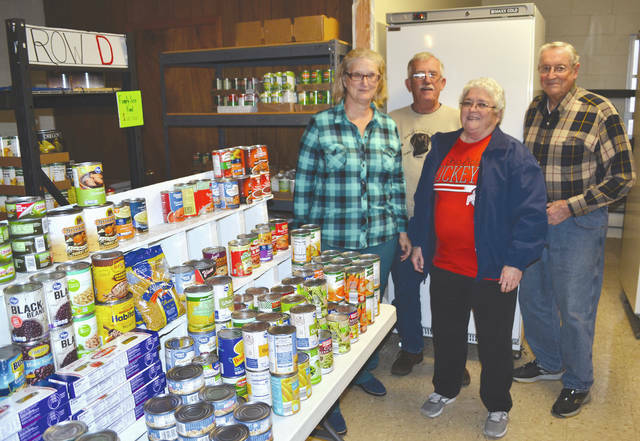 From left, Food Pantry volunteer Carrie Eleyet, Mechanicsburg Mayor and Lions Club President Greg Kimball, Food Pantry volunteer Elaine Riley and volunteer Bill Miller stand before the freezer purchased last year with the proceeds from the Lions Club raffle. All money raised from this year’s raffle will once again go to the Food Pantry, with a drawing on Dec. 22 for $500. Tickets cost $5 and may be purchased from any Mechanicsburg Lions Club member or by visiting the mayor.